In 2003, a resource entitled ‘Aboriginal youth: A manual of promising suicide prevention strategies’ authored by Jennifer White and Nadine Jodoin was published. It was used by communities across the country, and updated in 2004 and 2007. In the fall of 2015, the First Nations and Inuit Health Branch (FNIHB) of Health Canada (now part of Indigenous Services Canada) approached Jennifer with the suggestion that a new resource be created to further support the work of the National Youth Suicide Prevention Strategy (NAYSPS). This new resource provides an opportunity to build a bridge to existing efforts such as the First Nations Mental Wellness Continuum Framework and other national initiatives that have compatible goals including the work of the Assembly of First Nations (AFN), First Peoples Wellness Circle (FPWC), the Thunderbird Partnership Foundation (TPF), and the Canadian Association for Suicide Prevention (CASP). Much has changed in Canada since the publication of the previous document (including the recent Truth and Reconciliation Commission), and new research and practices are emerging related to suicide prevention that integrate political and cultural realities such as the First Nations Mental Wellness Continuum. The landscape of young people’s lives has also changed, with the pervasiveness of the Internet being one factor, and increased access to cultural and land-based teachings for some youth being another. Furthermore, the way people access information has changed, in part due to the reliance on online and other technologies. Meanwhile, many First Nations communities have disproportionately high rates of suicide relative to the rest of the country, while other communities have extremely low or zero rates of suicide. This project is committed to reducing suicide and suicidal behaviour among First Nations youth by ‘leading with the language of life’ rather than relying on deficit-centred language or risk factor-based approaches. This new resource is a compilation of wise practices for promoting life among young people based on what is already working and/or showing promise in First Nations communities across the country. The final product has been designed to be culturally relevant and responsive to the lived realities of young people and all who are invested in wellness for First Nations youth. This website is the culmination of a two-year project, funded and initiated by the First Nations and Inuit Health Branch (FNIHB) of Health Canada (now part of Indigenous Services Canada). This work showcases wise practices for promoting life among young people based on what is already working and/or showing promise in First Nations communities across the country, particularly in relation to preventing youth suicide. The online resource is designed to be culturally relevant and responsive to the lived realities of young people and all who are invested in wellness for First Nations youth. The intention is to honour and give credit to what is already happening in communities throughout Canada, and to draw links and connections among them for mutual benefit. This project aims to both be informed by, and potentially inform, a range of projects and resources related to the promotion of life, resilience and wellbeing among First Nations youth. As a way to support the National Aboriginal Youth Suicide Prevention Strategy (NAYSPS) and connect it with other related initiatives, the purpose of this project is to produce a useful, culturally relevant, accessible, and hopeful online resource to advance the goals of promoting life among First Nations youth in Canada. The project will bring together inspirational stories and wise practices from First Nations communities as well as findings from recently published research. These practices are shared on a web-based platform for maximum accessibility. Can be anywhere in Canada. Will speak to specific practices, approaches, and/or perspectives that either show promise or provide evidence of promoting life among First Nations youth by strengthening the fabric of community. Are life promotion and/or suicide prevention initiatives that relate to First Nations youth living on reserve or in First Nations governed communities. Demonstrate constructive community change through these practices. 'Lead with the language of life.’ That is, the initiative centres hope, life, and meaning, rather than deficit-centred or problem-focused approaches to preventing death. Are committed to centring Indigenous knowledges, and recognize the place of culture, community, spiritual life, and the land in relation to this work. The Wise Practices resource is intended to be both informed by and useful for on-reserve First Nations and/or First Nations governed communities throughout Canada. This is not an evaluation of the current NAYSPS. Primary focus will be on promoting wellbeing, preventing suicide, and community healing strategies (crisis intervention and individual mental health treatment are considered outside the scope). The FNMWC Framework was developed through collaboration between the Assembly of First Nations, Health Canada’s First Nations and Inuit Health Branch, the National Native Addictions Partnership Foundation, the Native Mental Health Association, and other community mental health leaders. 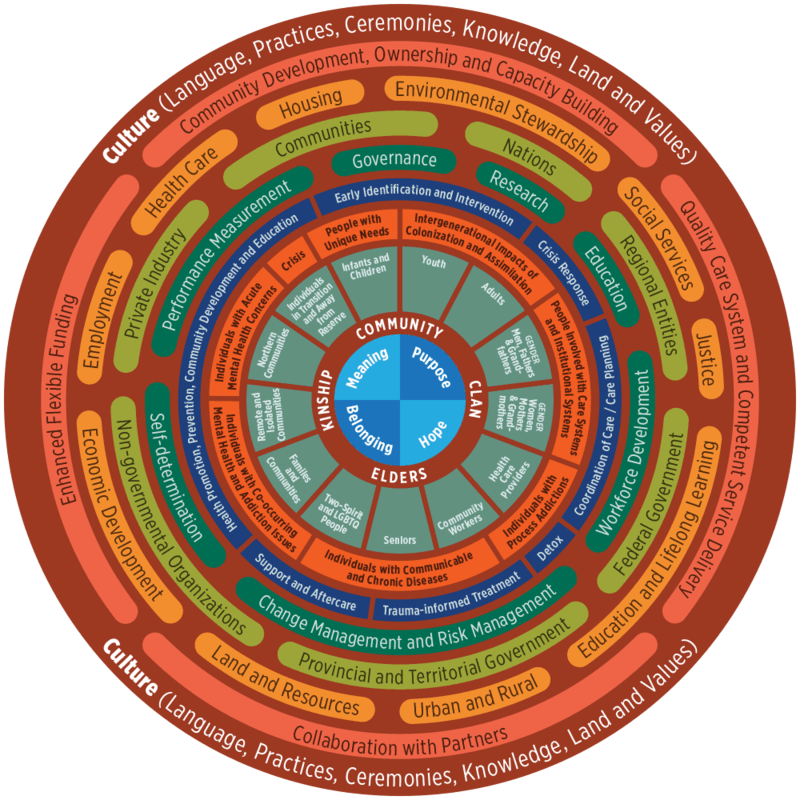 The various community practices shared on this site demonstrate some of the ways the elements of the First Nations Mental Wellness Continuum can be made ‘actionable’. By exploring these community stories in detail – with the elements of this Framework in mind – you will see how different First Nations communities are creatively engaging in life promotion and suicide prevention activities across the country.